Banaue Rice Terrace’s are found on the mountains of Ifugao and were carved there about 2,000 years ago by the ancestors of the present day Philippines. It is said that they were built by hand and were used to plant rice. Below are a few interesting facts about the terraces. 1. They are located about 1500 meters (5,000 Ft.) above the sea level on a 10,360 square kilometers (about 6000 square miles) mountainside. 2. The terraces are irrigated by water from catchment areas in the rainforests above it. 3. Today, although a few Ifugaos still plant vegetables on the terraces, most prefer concentrating on the tourist dollars brought by those who want to see the historic terraces. 4. It is said that the terraces is one of the most spectacular engineering feats to have been accomplished in the ancient world. If all the terraces were put end to end, they would equal to half the circumference of the earth. 5. In 1995, the UNESCO agreed with the Filipinos that the terraces were indeed a world heritage center. The UN body declared it so in the same year. 6. 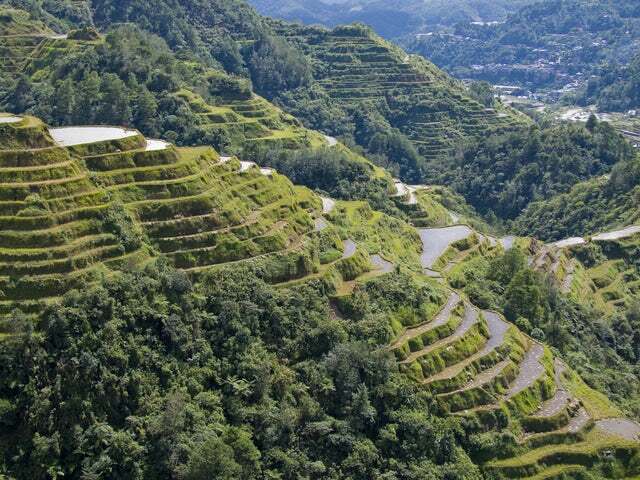 The Banaue Rice Terraces look like a giant's step stretching skywards. Some of the terraces are as high as 4,000 meters above the sea level. 7. Apart from the Banawe Rice Terraces in the town of Banawe are the Batad Rice Terraces and Bangaan Rice Terraces - which are less spectacular but worth your view. 8. Ifugao is the name of the province as well as the people who dwell there. 9. Since many young Ifugaos are not interested in farming, the soil on the terraces has started eroding and some of the terraces had to be redone. 10. The people of the province love having fun during the festival of tunggul. During the festival, they drink bayah or rice beer, eat rice cakes, and chew betel nut. On your next Philippines visit, make sure you see the ancient terraces. It will be one of your best holiday experiences.